Heat wok over high heat with 2 tablespoons vegetable oil. 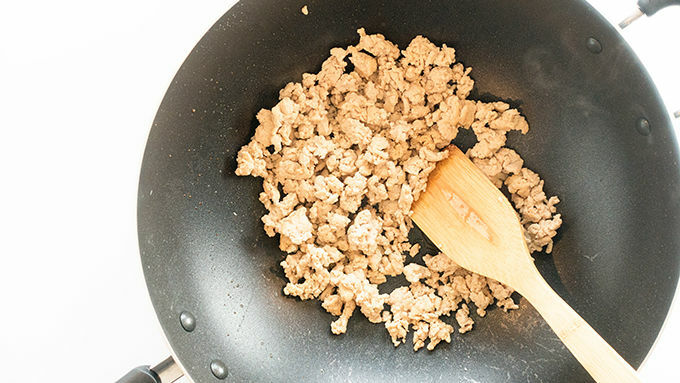 Add ground chicken and cook until no longer pink, breaking it up as it cooks. Remove chicken to a plate and set aside. Add remaining 2 tablespoons oil to wok and heat over high heat. 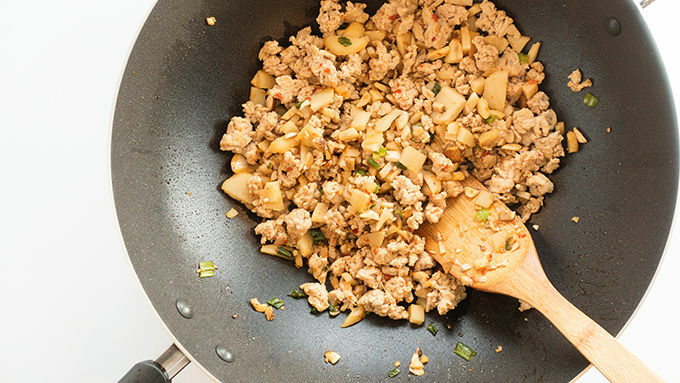 When oil is hot, add mushrooms, water chestnuts, green onions, garlic, and chili paste, stirring constantly as it cooks. Cook for 2 minutes. Return chicken to wok. Stir together soy sauce, hoisin, cornstarch, vinegar and sugar in a small bowl and add to wok. Cook 1 more minute. Remove from heat and keep warm in wok while preparing crispy rice noodles. 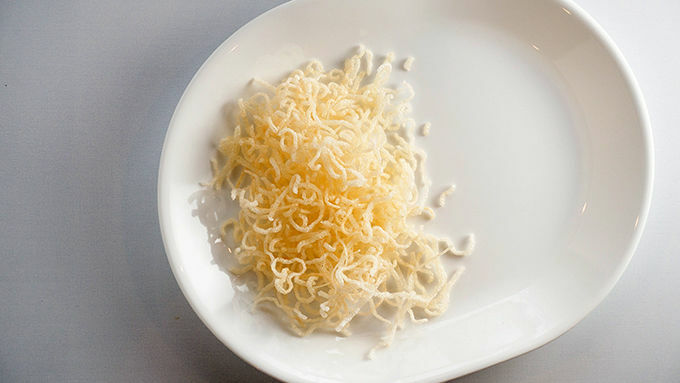 Heat 1 inch of oil in a large skillet to 375° F. Break up rice noodles and drop into hot oil. Fry 1 minute or until crisp, but not browned. Remove to a paper towel-lined plate to drain. 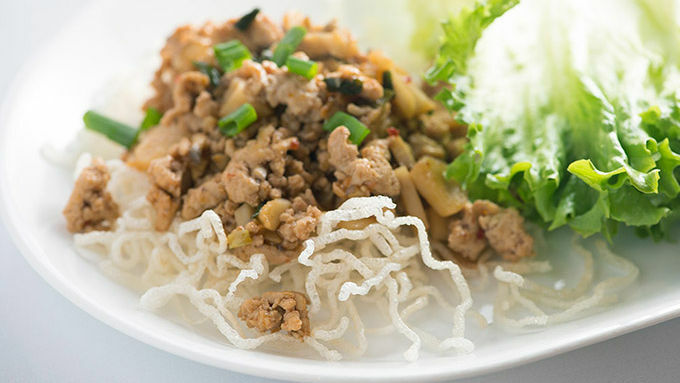 Serve stir-fry with crispy rice noodles wrapped in lettuce leaves. Once you start cooking, everything goes very quickly. Prepare everything in advance and have it nearby and ready to add to the wok as needed. Let’s talk lettuce wraps. You know how you love bread and carbs and all manner of bready carbs? Well, sometimes lettuce wraps swoop in and replace those bready carbs and you’re left with a frown. Because bready carbs. Right? 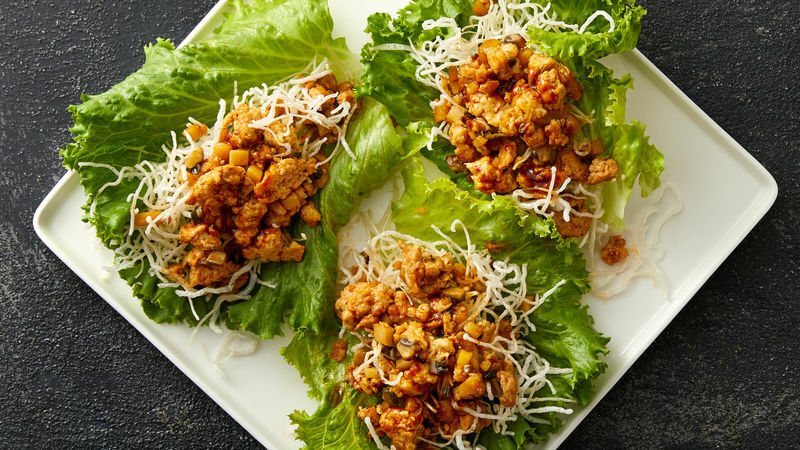 Other times, lettuce wraps swoop in and you’re like, “This was a match made in heaven, we should get married, someone call a preacher man.” Because some foods just taste better and more fresh and extra crunchy and packed with flavor when you put them in a big ol’ leaf of lettuce. Aaaaah. Refreshing! Anyway, these saucy little chicken lettuce wraps are one of those times that will have you planning a wedding. A wedding between you and your dinner. The chicken mix is so dang flavorful. There are crispy rice noodles all up in this situation. And then you put it all in a fresh, crunchy lettuce wrap and the flavors just BOOM—burst in your face!